Everything is fine, or will be, so we’ve been told. They just took Sierra to the NICU. Because my water broke between 31 1/2 and 33 hours before I delivered and I had a temperature of 103.4 degrees right after she was born, our pediatrician ordered some precautionary blood work for her after examining her this morning, even though she looks great. Her white cell count came back at 41,000, where normal is around 28,000, and one other test showed signs of inflammation. She is not running a fever, but the neonatologist who reviewed her results wants her admitted for at least 48 hours for IV antibiotics and more blood work. Lex went with her while they get her set up. I am not being discharged until tomorrow morning, so I have to stay here until then, although we’ve been assured that once she is settled I can go to see her as often as I’d like and whenever she needs to be fed. After I’m discharged tomorrow we will be able to stay here in one of the hospitality suites until she is released. Everyone we’ve spoken to keeps saying that she will be fine, that there are two scenarios that can play out here – she gets antibiotics and she has an actual infection OR she gets antibiotics and there was no infection – and in either case, she’s more than okay. That’s wonderful news, but I’d be lying if I said that I was anything other than hysterical right now. Please, think good thoughts, say a prayer, meditate – whatever it is you do in these circumstances – that our baby is going to be okay. 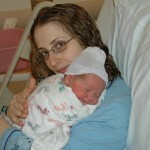 After a long labor, Lauren pushed Sierra Claire Friedman into the world at 12:34pm on Saturday, December 6th, 2008. 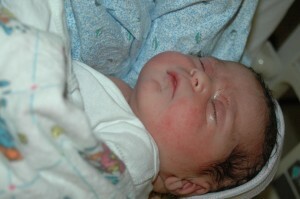 Sierra weighed in at 8lbs, 7oz, and 19″ long. 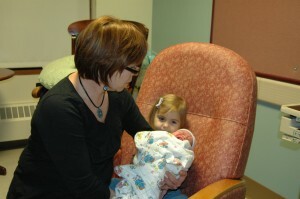 Sierra and Lauren are both healthy and doing great. We’ll leave the hospital Monday. Apparently I promised to post this a little over a year ago. Oh well, better late than never! After a nerve-wracking day (see these two previous posts from October 18), Lex and I went to sleep on October 18th, probably around 11. I woke up around 1 am to make my first bathroom trip of the night. After untangling myself from my body pillow, waddling to the bathroom and back, and climbing back into bed, I couldn’t fall back asleep. I was staring up at the ceiling fan for about 10 minutes when I felt a POP! and a gush. I woke up Lex and told him my water broke (He told me later that he was actually disappointed that I didn’t say “Honey, it’s time!” as I had been jokingly claiming I would do for weeks). He had to help me get out of bed and into the bathroom; luckily only my pantsand the towel I had been sleeping on were wet. As per our OB-GYN’s instructions to call if my water broke, Lex called the doctor while I sat on the toilet. We were less than pleased to find our our least favorite doctor in the practice was on call. He said that we should make our way to the hospital, but since I wasn’t having any notable contractions yet, we didn’t need to rush. We called my parents, since my mom was coming with us and my dad needed to come get the dog. My dad was actually still on his way home from the Met game he’d gone to that night. We arrived at the hospital a little after 3 am. We got checked in and settled into the room. Our first labor nurse was extremely nice. I really didn’t want to be hooked up to the fetal monitor even though Dr. Jerky was being insistent (despite that the other doctors in our practice had agreed I didn’t need to have continuous monitoring) and she got the doctor to agree to half an hour, just to get a baseline. Then we got some great news from the nurse – Dr. Jerky’s shift was over at 7 am, and our favorite doctor was on call for the next 24 hours! Woohoo! The next several hours were pretty smooth. We walked up and down the hall a million times, taking occasional breaks to be hooked up to the monitor. I should have tried to rest more, but I was too amped up to sleep. I started to have some contractions, but they weren’t that intense. I actually said to Lex that if this is what labor was like, this wasn’t going to be that bad. This is probably a good time to remind everyone that Lex and I attended a Bradley Method childbirth course and were 100% committed to natural childbirth – an amusing choice for a girl who cries when she stubs her toe. I think I was in a lot of denial about what labor was going to be like, and I don’t think I was actually that prepared for the experience. Our instructor wasn’t very good; I blame her, not the method. Sometime mid-morning I was sitting in bed, talking to my mom and Lex, when my eyes nearly popped out of my head as my water essentially broke a second time. I could not believe how much liquid had just left my body. I was sure I had either peed all over myself or that something awful had happened and there was going to be blood everywhere, but thankfully neither was true. Our second nurse of the day came in to help change the bedsheets and hook me back up to the monitor. After this the contractions got much more intense. They were coming every two minutes or less, lasting between 30 and 60 seconds. I really began to hate the monitor at this point. I didn’t want advance warning that they were coming, but my mom felt compelled to tell me every time the line began to rise. At 1:15, Dr. McFavorite came in and did another exam. 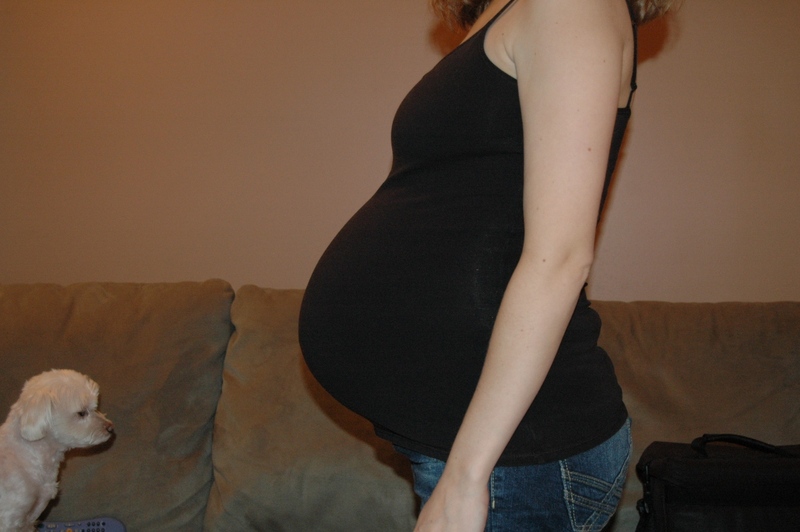 He said I was 5 cm dilated and the baby was at -3 station – not the news we were hoping for. I’d been in labor for 12 hours on 2 hours sleep, and though it had only been difficult for the last 4, I was getting tired and I was an absolute emotional and physical mess. 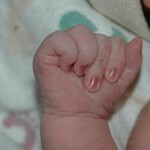 The contractions kept getting stronger and more frequent. It felt like they were constant – maybe 30 seconds between each one. I was starting to feel like I couldn’t take it anymore, and that got Lex pretty psyched – our labor instructor had said that when it starts to feel like that, you’re usually getting pretty close. The nurse did an exam at 3 pm, and she thought I was at about 10 cm since she couldn’t really feel my cervix, so she got the doctor right away. He did his own exam and confirmed that I was still at about 5 cm, -3 station. He told the nurse that my cervix was “way up there” and you really had to reach. What pleasant imagery, right? He was also pretty concerned at this point that I hadn’t made any progress in many hours and I was having a very difficult time. Given the ultrasounds we’d had the day before, he had doubts about whether I was going to be able to get this giant baby out of my body anyway, and he felt that if I didn’t relax I wasn’t going to progress. Lex was ready to consent to a c-section right there and then, but I was holding out for a vaginal delivery. 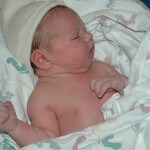 I blame the Bradley Method instructor again; she did a lot to scare us about epidurals and c-sections. Though it took a lot of convincing from Lex, my mom, Dr. McFavorite, and the nurse, I did give in and agreed to an epidural if we could continue to let me labor. I felt very guilty and was so scared that I was going to give birth to a “doped up” baby (Oh, you dumb, dumb Bradley Method lady!). I was also terrified of having a needle put into my back – that was part of my reason for choosing the Bradley Method in the first place. Before I could have the epidural, I needed to be hooked up to an IV to have fluids – I’d only had a saline lock until this point. After about 20 minutes we were told I was ready to go. The anesthesiologist came in and announced that as per hospital policy, Lex and my mother had to leave until the epidural was in place – something that had not been told to us until then. I was extremely distressed about that since I was so scared, but our nurse promised she’d stay with me and I’d be all right. Under protest, Lex left. The anesthesiologist got me set up, told me I’d have to stay perfectly still (not an easy thing for me to do, with the contractions) and then decided I still hadn’t had enough fluids, so we had to wait 5 more VERY LONG minutes. Then she gave me a shot of something to numb the area, inserted the needle, and said I would feel the effects in just a few minutes. It didn’t hurt as much as I had feared, though I was very freaked out by the (accurate) sensation of blood dripping down my back. The staff let Lex and my mom back into the room and reminded me that I wouldn’t be able to get out of bed anymore. 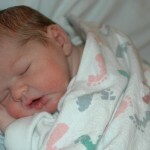 After the epidural kicked in, labor became a much more pleasant and I felt human again. It was a very bizarre sensation, not to be able to control my legs. I had to lift my right leg with my hands to get it to do what I wanted. We were able to have conversations, and I think I was able to sleep a tiny bit. 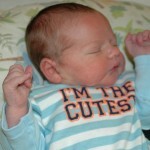 The contractions felt like pressure, nothing more. I was able to once again marvel at how much fluid was coming out of my body constantly. I was surprised that my stomach didn’t look smaller and that there was anything left. Around 5:30 the doctor came in and said I was up to 7 cm, so that was promising. I was concerned I wouldn’t be able to push, and he assured me they would turn the epidural down enough for me to be able to feel my muscles enough to push. 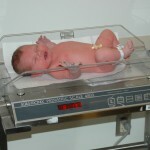 He came back again at 6:45 and I was now up to 8 cm, still at -3 station, though the baby’s head was molding a bit. He felt the baby’s heart rate was dropping, so they rolled me on my side, put me on an oxygen mask, and tried to stimulate her head. That seemed to help. Nurse #3 (yes, we were on our third shift) came in to see how I was doing sometime after 7, I said I thought I probably needed to pee, but I wasn’t sure. She brought me a bedpan; I never thought I’d see the day when I’d have to ask someone to check to see if I’d peed or not. I hadn’t. She did a Foley catheter – I’m SO glad I couldn’t feel that! The doctor came back every hour or so to check, but I seemed to have stalled at 8 cm, and the baby just wasn’t dropping. At 9:30, after examining me again and finding that I still wasn’t getting anywhere, Dr. McFavorite expressed some real concern that this might be the baby’s way of indicating that she just couldn’t fit. He didn’t think that I was going to progress without intervention. 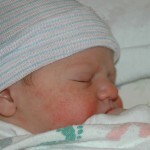 I had been in labor for 20+ hours, and he said my options were to see if Pitocin would move things along, or do an emergency c-section (I’m not sure how Dr. McFavorite is coming off here, but he was extremely supportive and caring throughout all of this). He wasn’t as concerned about her head as he was about her shoulders and stomach. He thought there was a considerable risk of me breaking her collarbone. 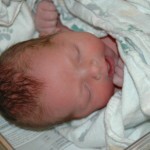 I asked him to explain everything that would be involved in the c-section, and then he left us to discuss. After a very teary, emotional debate, Lex and I consented to the c-section. Nurse #3 and another nurse came in to prep me (shaving, a catheter that would remain in until the next day, adjusting the epidural, moving me to a gurney…). I think I cried through most of this. 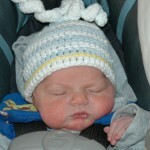 I’d never had major surgery before, and I was still so scared about whether the baby would be okay. Lex went to change into scrubs while they wheeled me in. I was assured they wouldn’t start without him. Once in the operating room, I met the doctors and nurses who would assist. They set up the screen, and I was very concerned that I could see my reflection in the lights, but they promised me they would be moved. I was given an injection of a stronger anesthesia plus morphine, making me numb to my chest. The new anesthesiologist did a scratch test to see if I could feel my belly still, and I (quite hysterically) said I could and please don’t start yet! They must have tested me again and decided that since I didn’t react I couldn’t feel anything, because I suddenly became aware that things had started. Lex came in and sat by my head just after they began. I felt tugging, but not much else. Dr. McFavorite said I was about to feel a lot of pressure as they pushed the baby out, but that everything was fine. Then it felt like an elephant was sitting on my stomach. At 10:22 pm, on October 19th, 4 days before my due date, I heard an alien-like gurgling sound, and Lex turned to me, and in what will always remain in my top ten favorite memories of him, said in pure joy and wonder, “She’s here!” They said he could stand up to see her. He later told me that he got quite the view of my intestines – something he had NOT been expecting – and that Anya began her life by promptly peeing all over me. I was taken to recovery; the two hours I spent there felt like two years. Lex came in to see me after I’d been there about an hour, and I was livid – he was supposed to stay with Anya no matter what – but they kicked him out of the NICU because he had been under the lights they had on Anya, and he had been overheating to the point of nearly passing out. He said my mom stayed by the window to watch her. 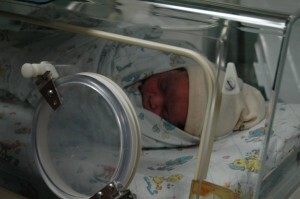 He left after a few minutes, then later came back with Anya in her isolette, and we all went to the postpartum ward. 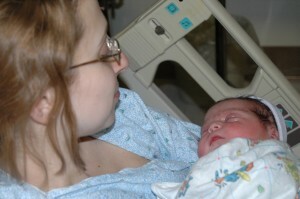 After we were all situated I was finally allowed to hold her. She was SO alert – not at all dazed like the instructor from my course had said epidural babies would be. I truly thought she was beautiful, despite the head-to-toe rash she’d been born with and the puffy eyes from the antibiotic drops. 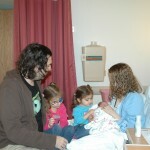 She latched on right away, though it would take a few weeks for us to get the hang of nursing confidently. Her billirubin levels were 0 every single time – they kept rechecking to make sure that was right. Her blood sugar was checked a few times because of her size, but it stayed in an acceptable range. She failed the hearing test in one of her ears the first time due to lack of cooperation or something, but when the doctor retested her she passed. 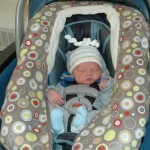 We were all released on four days later on her due date, and we went home to begin our brand new life together.